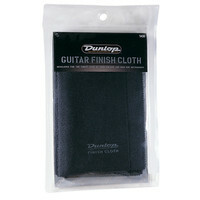 This deluxe guitar finish cloth provides the perfect finish to your guitar after cleaning. 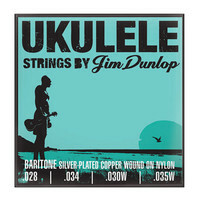 The Dunlop Baritone Pro ukulele strings combine the upmost building quality with great materials to create a consistently solid tone. With copper winding you can be sure to achieve the strong bass tone needed from the baritone tunings. The strings bring a combination of pronounced clarity with warm subtle overtones to produce a sound capable of live studio and practise use. The nylon blend used for the strings is both long lasting and has improved flexibility so you get all the tonal quality you need. The string gauge sizes further tonal depth and complexity as well as complementing the tenor size. All Dunlop strings are inspected rigorously to ensure that every pack has the same accuracy and quality every time. Adjustable guitar Strap featuring leather ends and comfort edge webbing. The Dunlop Super Bright Guitar Strings are for players who want a bright and punchy sound with crystal clear chords. Super Bright string formula balances fundamental lows with upper order harmonies to create a sound thats lively and expressive without being harsh or thin. M/H Set. The Dunlop Super Bright Guitar Strings are for players who want a bright and punchy sound with crystal clear chords. Super Bright string formula balances fundamental lows with upper order harmonies to create a sound thats lively and expressive without being harsh or thin. MD Set. 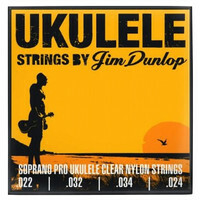 The Dunlop Soprano Pro ukulele strings combine the upmost building quality with great materials to create a consistently solid tone. The strings bring a combination of pronounced clarity with warm subtle overtones to produce a sound capable of live studio and practise use. The nylon blend used for the strings is both long lasting and has improved flexibility so you get all the tonal quality you need. The Pro set have slightly thicker string gauges to further tonal depth and complexity. All Dunlop strings are inspected rigorously to ensure that every pack has the same accuracy and quality every time. 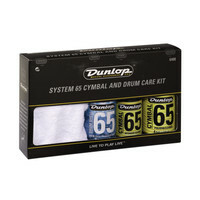 Includes 65 Drum Shell Polish and Cleaner 65 Cymbal Intensive Care 65 Cymbal Cleaner Drum Cleaning Mitt and care instructions. The Dunlop Super Bright Guitar Strings are for players who want a bright and punchy sound with crystal clear chords. Super Bright string formula balances fundamental lows with upper order harmonies to create a sound thats lively and expressive without being harsh or thin. HYB Set. 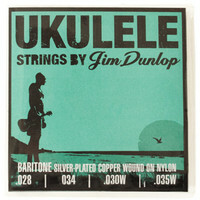 Dunlop Ukulele strings offer a traditional balance of warm overtones and superb clarity with excellent dynamics and sustain to communicate your unique playing style. The Dunlop Herco Vintage 66 is a recreation of the classic Herco pick chosen by prominent players leading guitar-driven music in the mid 1960s. Choose Dunlop Pyrex Glass Slides for a warmer thicker tone accentuating the middle harmonics of your sound. 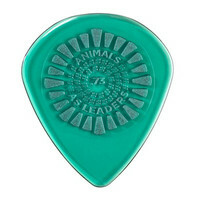 The Dunlop Animal as Leaders Primetone plectrums are an ideal way to produce the outstandingly heavy riffs that your music requires. Made in collaboration with Tosin Abasi and Javier Reyes these picks present a combination of reliability and authenticity. The edges have been polished by hand to give an classic feel on the strings right from the beginning of use. Chromed steel slides are perfect for creating the bright metallic tones preferred by electric guitarists. While sliding they produce percussive sounds and overtones on the strings that add a desirable ambiance to slide playing. Chromed steel slides are most popular for rock metal and blues styles on electric guitar. Acoustic players also favour them to add unmistakable slide ambiance to their tone.